The official flag of the Congress during the Independence struggle. Indian National Congress, Congress-I (also known as the Congress Party and abbreviated INC) is a major political party in India. Created in 1885 by A. O. Hume, Dadabhai Naoroji and Sir Dinshaw Edulji Wacha, the Indian National Congress became the nation's leader in the Independence Movement, with over 15 million Indians involved in its organizations and over 70 million participants in its struggle against the British Empire. During this phase, it functioned not so much as a political party than as a forum for Indians and their British supporters to express to the colonial authorities their views, opinions and to assert India’s right to self-determination. After independence in 1947, it became the nation's dominant political party, in power from 1947 until 1977, then from 1980 to 1999, 1991 to 1996 and winning the 2004 general election. In the 14th Lok Sabha (2004-2009), 145 INC members, the largest contingent amongst all parties, serve in the house. The party is currently the chief member of the ruling United Progressive Alliance coalition supported by the Left Front. Famous members include Annie Besant, its first woman INC President, Mahatma Gandhi (President in 1924) and Sarojini Naidu, the first Indian woman President (1925) and the first woman State Governor and India’s first woman Prime Minister, Indira Gandhi. The INC has traditionally tried to bridge communitarian divides, regarding the secular principle as most appropriate for a multi-religious state. Concern for maintaining communal harmony had led to criticism of favoring minorities, especially Muslims. On the one hand, Congress is closely identified with pride in India’s cultural legacy. On the other, it has promoted women’s rights and social reform in such areas as untouchability and economic empowerment, tending towards socialist principles. The Congress has also had electoral success in many Indian states, controlling the majority of state governments for the first 20 years of independence. The post-independence era, when as a political party Congress enjoyed a prominent place in Indian politics, ruling the country for 48 of the 60 years since independence in 1947. M. K Gandhi was spiritual leader of the INC and the acknowledged "father of India." Founded in 1885 with the objective of obtaining a greater share in government for educated Indians, the Indian National Congress was initially not opposed to British rule. The Congress met once a year during December. Indeed, it was a Scotsman, Allan Octavian Hume, who brought about its first meeting in Mumbai, with the approval of Lord Dufferin, the then-Viceroy. Womesh Chandra Bonerjee was the first President of the INC. The first meeting was scheduled to be held in Pune, but due to a plague outbreak there, the meeting was later shifted to Mumbai. The first Session of INC was held from 28-31 December 1885, and was attended by 72 delegates. A few years down the line, the demands of INC became more radical in the face of constant opposition from the government, and the party became very active in the independence movement. By 1907 the party was split into two halves: the Garam Dal of Bal Gangadhar Tilak, or Extremists (literally "hot faction"), and the Naram Dal of Gopal Krishna Gokhale, or Moderates (literally "soft faction"), distinguished by their attitude towards the British. In its time as the nation's leader in the freedom struggle, it produced the nation's greatest leaders. Before the Gandhi Era came leaders like Bal Gangadhar Tilak, Bipin Chandra Pal, Lala Lajpat Rai, Gopal Krishna Gokhale, Mohammed Ali Jinnah (later leader of the Muslim League and instrumental in the creation of Pakistan), all starting with the first legendary icon of Indians: Dadabhai Naoroji, the president of the sister Indian National Association and later the first Indian Member of Parliament in the British House of Commons. With the rise of Mahatma Gandhi's popularity and his Satyagraha art of revolution came Sardar Vallabhbhai Patel, Pandit Jawaharlal Nehru (the nation's first Prime Minister), Dr. Rajendra Prasad (the nation's first President), Khan Mohammad Abbas Khan, Khan Abdul Ghaffar Khan, Chakravarti Rajgopalachari, Jivatram Kripalani and Maulana Abul Kalam Azad. The Congress under Gandhi's influence became the first integrated mass organization in the country, bringing together millions of people by specifically working against caste differences, untouchability, poverty, and religious and ethnic boundaries. Although predominantly Hindu, it had members from virtually every religion, ethnic group, economic class and linguistic group. At the time of the Quit India movement, the Congress was undoubtedly the strongest political and revolutionary organization in India. The Indian National Congress could claim to be the true representative of the Indian people. The 1929 Lahore session under the presidency of Jawaharlal Nehru holds special significance as in this session "Poorna Swaraj" (complete independence) was declared as the goal of INC. The 26th January 1930 was declared as "Poorna Swaraj Diwas," Independence Day although the British remained in India a number of years longer. It was to commemorate this date particularly that The Indian Constitution was formally adopted on 26 January 1950 (even though it was passed on 26 November 1949). 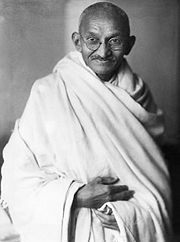 After the First World War the party became associated with Mahatma Gandhi, who remained its unofficial, spiritual leader and mass icon even as younger men and women became party president. The party was in many ways an umbrella organization, sheltering within itself radical socialists, traditionalists and even Hindu and Muslim conservatives. The party remained in power for thirty continuous years between independence in 1947 and its first taste of electoral defeat (at the national level) in 1977. Mahatma Gandhi and Sardar Patel are said to have held the view that the INC was formed only for achieving independence and should have been disbanded in 1947. However, at the time of independence, the INC (led by Jawaharlal Nehru) was a major political organization in the country, and was established as the major political party. The Congress thus, considering the perceived need for a stable leadership and guiding vision after the terrible chaos and confusion following the Partition of India and Independence, was re-established as an electoral party in independent India. Across several general elections, the party ruled uninterrupted until 1977, and has remained a major political force. After the murder of Gandhi in 1948 and the death of Sardar Patel in 1950, Jawaharlal Nehru was the sole remaining iconic national leader, and he became key to the political potency and future of the Congress. Nehru embraced secularism, socialist economic policies and a non-aligned foreign policy, which became the hallmark of the modern Congress Party. Nehru's policies challenged the landed class, the business class and improved the position of religious minorities and lower caste Hindus. A generation of freedom fighting leaders were soon replaced by a generation of people who had grown up in the shadow of Nehru. Nehru led the Congress Party to consecutively awesome majorities in the elections of 1952, 1957 and 1962. After Nehru's death in 1964, the party's future first came into question. No leader was competitive enough to touch Nehru's iconic status, so the second-stage leadership mustered around the compromise candidate, the gentle, soft-spoken and Nehruvian Lal Bahadur Shastri. Shastri remained Prime Minister till his own death in 1966, and a broad Congress Party election opted for Indira Gandhi, Nehru's daughter, over the right-wing, conservative Morarji Desai. In 1955 in Awadi session the party adopted a socialistic pattern of society for India. The first serious challenge to Congress hegemony came in 1967 when a united opposition, under the banner of Samyukt Vidhanayak Dal, won control over several states in the Hindi belt. Indira Gandhi, the daughter of Nehru, and Congress president, was then challenged by the majority of the party leadership. The conflict led to a split, and Indira launched a separate INC. Initially this party was known as Congress (R), but it soon came to be generally known as the New Congress. The official party became known as Indian National Congress (Organisation) led by Kamaraj. It was informally called the Old Congress. As Indira Priyadarshini had control over the state machinery, her faction was recognized as the "real" INC by the Election Commission of India, although her organization was the break-away group. The split can in some ways be seen as a left-wing/right-wing division. Indira Gandhi wanted to use a populist agenda in order to mobilize popular support for the party. She raised slogans such as Garibi Hatao (Remove Poverty), and wanted to develop closer ties with the Soviet Union. The regional party elites, who formed the INC(O), stood for a more conservative agenda, and distrusted Soviet help. INC(O) later merged into the Janata Party. Gradually, Indira Gandhi grew more and more authoritarian. Following allegations of widespread rigging in the general elections, a court overturned Indira Gandhi's victory in the Parliamentary constituency. Facing growing opposition she proclaimed a state of National emergency in 1975, curtailed the powers of the courts, and unleashed a police state with herself as the supreme leader ('acting Prime Minister'). After she lifted the emergency in 1977, more Congress factions were formed, the one remaining loyal to Indira Gandhi being popularly known as Congress(I) with an 'I' for Indira. The Congress (I) was routed in the general elections by the Janata Party. The party was able to return to power in the 1980 elections. In 1984 Indira Gandhi was assassinated by two of her Sikh bodyguards, as a revenge for Operation Blue Star. In the following days thousands of Sikhs were killed in the 1984 riots, mainly in Delhi, by activists and leaders of the Congress Party. . About the riots, the new PM and Indira's son, Rajiv Gandhi had infamously remarked, "When a big tree falls, the earth is bound to shake." After Indira, her son Rajiv Gandhi, took over as Congress leader and led the party to victory with a large majority in the 1984 Lok Sabha elections. It governed from 1984-9 and then was defeated in the 1989 general election. Rajiv Gandhi was also assassinated by the LTTE during the course of the election campaign in 1991. Following Rajiv Gandhi's assassination, P.V. Narasimha Rao succeeded him as Congress leader and became prime minister. The 1990s was a period of prolonged crisis for the Congress. After gradually losing political influence the party asked the Rajiv Gandhi's widow, Sonia, to accept the position as Congress President. Refusing in 1991, the Congress stuck with Narasimha Rao. Rao dramatically changed the party's traditionally socialist policies and introduced major economic reforms and liberalization, with the help of then Finance minister (and future Prime Minister) Manmohan Singh. Nonetheless, his involvement in the bribery of members of parliament was a major issue which led to the downfall of the Congress in 1996, and subsequently his own disgraced exit from politics. Former treasurer Sitaram Kesri took over the reins of the party and oversaw the Congress support to the United Front governments that ran from 1996 - 1998. During his tenure, several key leaders broke away from the party, and serious infighting broke out among those left. In 1998, Sonia Gandhi finally accepted the post of Congress President, in a move that may have saved the party from extinction. After her election as party leader, a section of the party, which objected to the choice, broke away and formed the Nationalist Congress Party. (Where breakaway factions are active, the use of "Congress (I)" to denote the party run by Indira Gandhi's successors continues.) There have been repeated attempts by the Indian nationalist groups (such as the BJP) to discredit Sonia Gandhi's leadership on the basis of her foreign origin - she is Italian-born. Although the Congress expedited the downfall of the NDA government in 1999 by promising an alternative, Ms. Gandhi's decision was followed by fresh elections and the Congress party's worst-ever tally in the lower house. The party spent the interval period forging alliances and overseeing changes in the state and central organizations to revive the party. It has had many electoral successes which led up to the formation of a Congress-led government in 2004. Anti-Sikh riots - After the assassination of Indira Gandhi by Sikh Body Guards following Operation Bluestar, many Congress workers prominently including Jagdish Tytler and Sajjan Kumar were accused of inciting and participating in anti-Sikh riots that killed thousands. The Congress apologized many years later for its silence on these events, an apology that was considered inadequate by some of those concerned. Volcker report - The Independent Inquiry Committee (IIC) appointed by the United Nations in its final report released on October 27, 2005 confirms that documents state: 'Beneficiary: India: Congress Party' with an entitlement of 4 million barrels of crude' and `Beneficiary: India: Singh Mr K. Natwar' with an entitlement of 4 million barrels'. The opposition Bharatiya Janata Party has repeatedly accused the Congress of showing favoritism to the Indian Muslim community and the toleration, or even promotion of, Islamic and obscurantism. Congress policy is also accused of causing fifty years of economic stagnation, following Independence, and of excessive veneration of the Nehru-Gandhi dynasty. In the 2004 general elections, the Congress alliance won the largest number of seats and got an assurance of support from the Left Front upsetting the Atal Behari Vajpayee-led National Democratic Alliance, which was variously forecasted to win outright victory or at least emerge as the largest alliance. 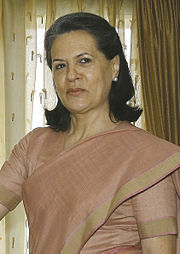 Shortly thereafter, Sonia Gandhi was nominated by the Congress-led United Progressive Alliance to be the next Prime Minister. But in what was described as the dropping of a political bombshell, Sonia Gandhi refused to take the position based on her "inner voice." She backed eminent economist, former Union Finance Minister and senior Congress leader Dr. Manmohan Singh for the post of Prime Minister, and he was sworn-in as Prime Minister on May 22, 2004. He became India's first Sikh head of government. The organization developed by Mahatma Gandhi's reorganization of the Congress in the years of 1918 to 1920 has largely been retained till today. In every Indian state and union territory or pradesh, there is a Pradesh Congress Committee, which is the provincial unit of the party, responsible for directing political campaigns at local and state levels and assisting the campaigns for Parliamentary constituencies. Each PCC has a Working Committee of 10-15 key members, and the state president is the leader of the state unit. The Congressmen elected as members of the states legislative assemblies form the Congress Legislature Parties in the various state assemblies, and their chairperson is usually the party's nominee for Chief Ministership. The All India Congress Committee is formed of delegates sent from the PCCs around the country. The delegates elect various Congress committees, including the Congress Working Committee, which consists of senior party leaders and office bearers, and takes all important executive and political decisions. The President of the Indian National Congress is in effect the party's national leader, head of the organization, head of the Working Committee and all chief Congress committees, chief spokesman and the Congress choice to become the Prime Minister of India. Constitutionally, the president is to be elected by the vote of the PCCs and members of the AICC. However, this procedure has often been by-passed by the Working Committee, choosing to elect its own candidate as an emergency measure. The Congress Parliamentary Party is the group of elected MPs in the Lok Sabha and Rajya Sabha. Their elected chairperson is the leader of the majority, and supposed to be the Prime Minister. However, there have been notable exceptions. ↑ Jawaharlal Nehru, India’s first Prime Minister, associated capitalism with imperialism and did not think that it could provide answers to India’s social needs. Chandra, Bipan, Amales Tripathi, and De, Barun. Freedom Struggle. New Delhi: National Book Trust, India, 1982. ISBN 812370249X. History of "Indian National Congress"
This page was last modified on 10 April 2014, at 16:49.